OK, this looks like one of those trick APE cranks... Look closer, it is a Hondamatic crank...but what you can't see is that it is a 5 mm stroker. Add one of these 68 mm stroke cranks to your APE 1000 cc kit and you have a stump pulling 1077cc. If you can't afford Jays 1,000cc conversion or Mikes 1,000cc billet block, this crank will take your 836 out to 902cc. Are you doing this to "normal" cranks Jay ? and do Carillo make rods to suit ?.. +1, Tell us about the rods. I am not sure what this customer is doing for rods, but we would do this to any 750 sohc crank and supply 2.5 mm shorter Carrillos. Oooher, so with 70mm pistons this'll give you a capacity of 1077 cc, then that'll give me 1138cc with my 73mm pistons? Anyone wanna buy a shiny new lightened and balanced APE crank, I think it's time I upgrade! From the sounds of things Mick could use that as an anchor! Just when I thought I had the wish list fullfilled. This one is definately going in BUT could there be another begging for a few more cubes? Big Jay, that is perfect. Well, if these rods manage to get turned into Nasi Goreng, I'm taking my ball and going home to Mum. Great news that the "Samauto" is moving forward. We're all waiting with baited breath to hear about it roaring into life. I'm itching myself Mick, It'll soon be March and I've just paid my air fare. Another thing I'm itching to see is, who is going to be the first one to fire up their JMR billet motor. I spoke to Eric the other night on the phone, his motor is ready to go and he was just waiting on his CR750 frame to come back after being converted to CR spec. All going well Sam, I'm hoping that there will be some thunder from Down Under coming from Mikes Billet Motor this year. A few other unforseen hurdles to deal with last year slowed progress for a bit and Mike is preparing the cylinder head. One thing is for sure, it is going to happen. Just gotta keep the wood on it and nothings going to stop progress even if things slow up a bit. Do it once and do it good. Why can't a base plate be used wth the stock rods? I couldn't get my head around that one either Frank, but never having played with a stroker, thought I'd best keep it shut. Wouldn't a base plate mean that you have to have another gasket, therefore you are just giving the engine one more place to leak..? I've fitted 900 DOHC rods before and a .060" spacer plate under the block with no problems. If everything is perfectly clean and flat, it should all be good. It's the crank that determines the stroke. The length of the rods only determine where the piston reaches in the bore. With the shorter rods, the piston don't pop out the block (no need for spacer) but it travels further down the block. As long as the sleeve is long enough at the bottom and it and the pistons clear the crank, no problem. Stump pulling or stud pulling? Just asking. If we all could switch the ignition to the other side, ideally the cycle-X optical trigger - maybe use a total-loss system so you don't need the generator, then a CB900 crank would fit the CB750A primary shaft, right? So I've gotta ask - if the generator and ignition stuff could be reversed on the DOHC as well, or more to the point use a different adapter to mount each on it's own correct side - then what all could this thing do for the CB900F/CB1100F? Is this a stroker crank for DOHC or really the same stroke anyhow? An alternative stroke length might be interesting for building 999cc-1025cc competition-spec power-plants, for AHRMA etc. I know of a few projects on the DOHC 'F-orum where alternative stroke lengths were used to combine with the RSC DOHC-block and off-the-shelf piston kits, to build a custom displacement to meet class rules of some sort or other. 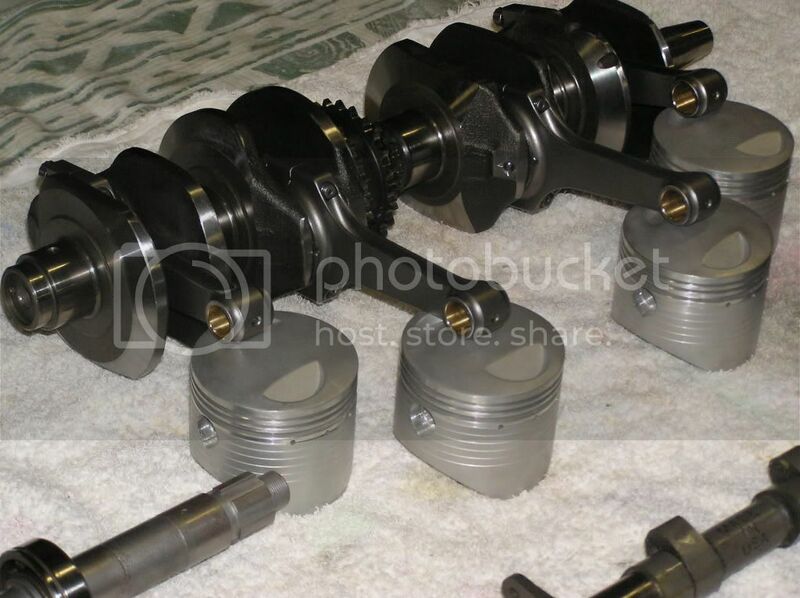 I had always figured a short-stroke 750 crank and 1123cc kit would make for the best engine, and I guess this is feasible using custom length rods and a block bored out for new sleeves with the oil leak channels welded up shut - the DOHC 750 has the air flow channels between each pair of outer cylinders, whereas the 900 & 1100 are solid between the jugs - hence the need for the oil-coolers to make up for all of those lost fins & surface area, etc. I put the idea forward, just as a "what if" some years ago, but I was told that the block would have to be skimmed or something, and that the DOHC blocks only have a certain depth of the full size in a "lip" at the top and bottom. Doesn't make sense IMHO, as I was suggesting custom length rods anyhow. Perhaps an adjustment to the cam-chain length even? More like a stretched 750 chain.... Anyway yeah, somebody's building one right now, more or less similar to what I had described. "Great Minds Think Alike" ha-ha. Well it begs the question though, just what all could be done with yet more alternative stroke lengths. This has got to be soo much "easier" for the GS & KZ folks with their roller-bearing cranks, hey? Very cool. I won't tell ANYONE! The DOHC-4 cranks were 69mm stroke, iirc. Like I sez, I was always more interested in a SHORT-stroke motor with the 73mm pistons from the 1123cc kit mated to a CB750F crank, for a sub 1000cc displacement that would allow unrestricted diameter carbs in AHRMA "Forgotten Era" - The shorter stroke should help spin things up faster, maybe even keep the piston speed down to the point you can run a much higher RPM than otherwise? Even so, yeah - I should think there ought to be some application for a stroke length midway between the 63mm & 69mm OEM cranks? One has to wonder at the possibilities, where if you're boring out the top crank-case AND going with a custom billet block, AND a custom crank, new sleeves in the block, etc etc - What all might be done if we changed the barrel-to-barrel SPACING? Move the two outer cylinders slightly further outboard, and think of how the bore might stretch even bigger still! Yeah, the valves might have some difficulty lining up - But since we're really only talking about a matter of mere millimeters, one has to wonder at the possibility of a larger valve guide being reamed eccentric to the outboard, and that bigger diameter valve guide needn't be all THAT much of a hindrance not of we're talking about a fully ported head. Right? I mean, YEAH - it's a whole lot more work. Pretty outrageous stuff. Dunno whether the crank already EXISTS with the standard main bearing spacing, yet with the two outer rod journals spaced further outboard. The most ridiculous thing you'd have to do would be a PRESSED-UP crank, with or without roller bearings shoehorned into milled out crank-case journals - Of course since we're only talking about a couple of millimeters, it MIGHT be feasible to grind out a couple of mm's to one side or another - Surely the crank webs wouldn't be TOO thin at that point? One way or another, SURELY it's FEASIBLE somehow? Expensive as hell, yeah. Perhaps as a pet project for some wealthy "captain of industry" in the engine building racket? Ha-ha. What all would you need? However many mm's you expanded over the current max bore, you'd need HALF that for the off-set, correct? So if you're talking about a 75mm bore you'd go outboard one millimeter? 77mm would require two mm's? Not only for the crank, the block, but also the valve guides? Gotta wonder what the new theoretical limit might be. The holes carved into the top case, however much material were left on the top face? The gap required for the cam-chain tunnel & the tensioners fitted within with their roller pins? The crank webs themselves? The included valve angle? The exhaust ports? From what the aforementioned DOHC-4 monster tells us, it would seem like you sure don't want your inlet tracts to be even MORE twisted out of the straight through & through. If you can't build the exhaust outlets and carb inlets far enough outboard, so as to run everything straight as the crow flies, well apparently THAT's the real limitation on power production - or so I'm told. IMHO, there's a lot of potential in adding fins to the outer walls of the water jacket on a later era liquid-cooled motor, making retro-fried side covers for 'em, maybe a nice polished round-domed valve cover - something which LOOKS for all the world like the SOHC-4 series, but which is really a CBR954RR engine at it's heart. Or a V65 Magna with a shaft-to-chain conversion ala Magni MV-Agusta or Yam' XS-Eleven, etc etc, done up as homage to the Cezeta CZ Type 860 - Or a copy of the CB750P7-ii 5-bolt dual-disc 40-spoke front hub, along with a wire-spoke conversion of the 5-lug COMSTAR rear hubs to effect a wire-spoke conversion on the GL1100 & GL1200 BIG 'WING and then grab some sort of BEEMER race fairing, move the cross-brace on the swing-arm for a taller rim & tire, and thereby whip up a bigger displacement version of the Doncque DLF-1000 Endurance-Racer! Well either which way, yeah - I think there's massive potential in doing the retro-fried treatment on the later era motors, in addition to the expected bodywork & running-gear etc. As for the SOHC-4, I should think the missing element isn't so much in the motors as the CHASSIS - If we could have a decent batch of EGLI replica frames, or more to the point the twin-shock "spine" type frame from MOTO-MARTIN. But above all else the Akront "NERVI" rims for some rebuilt COMSTAR wheels, half the weight in equivalent sizes, available in any width you could possibly dream up for a SOHC-4, all the way out into the 6.0x18" type of stuff which barely looks sensible on a CBX six but let's say IF you wanted something that ridiculous on a SOHC-4 you could have it, or COULD'VE had it, if only we'd begun to rebuild our Comstar wheels BEFORE they were yanked from production! Yeah, if we can get the MORAD people to bring 'em back, we could do some truly awesome stuff with the SOHC-4, get 'em around the track a whole lot quicker. IMHO a really important part would be a 296mm spec caliper hanger for the 'F2 dual-disc fork (& subsequent DOHC-4 versions of which) not to mention a new center-carrier & caliper-hanger to adapt the 260mm 6-rivet front rotor from CB350F & CB400F onto the 6-bolt & maybe even 5-bolt rear disc hubs - maybe even a 10-bolt pattern to suit 5-bolt AND 6-bolt rear hubs? Paired up with a caliper-hanger to suit, made so as to KEEP the original single-puck calipers (or an exchange-basis modification of the earlier opposed-pair twin-piston rear calipers, the axle hole welded shut & re-drilled etc etc) All of which would be intended for a complete OEM look on a far far better all 'round brake package. Just sayin' - there are a ton of NON motor related elements of these bikes which could use an upgrade. And when they're done in a STEALTH upgrade, it might just stem the tide of all this STARBUCKS RACER nonsense we've seen these past ten or fifteen years, with the USD forks & 17" cast wheels, the billet shillet bedazzled all over the place, rendered in purple anodize like some sort of radioactive bird poop has landed all over the bike? BLECH. And more to the point - MEH. If we could only make it easier to improve things in the OEM style, maybe people wouldn't just want to throw some random crotch-rocket's complete front end at these bikes? A bit more expensive, to be sure - but not quite so much if they're whipped up in batch production. And everything to be offered piecemeal, step-by-step. The bigger front discs, the thicker fork, the thicker front axle, the lighter weight yet wider Akront "NERVI" rims for the COMSTAR wheel rebuild, perhaps an exchange-basis service for milling weight out of the rear hubs whether Comstar type OR the wire-spoke - And of course the smaller rear disc center-carrier & matching caliper hanger. A custom FRAME copied from one of the greats, maybe all of 'em? But each one amenable to the OEM bodywork, suspension, running-gear etc? Well mainly the brakes & axles & OEM period-correct (more-or-less fork swaps, etc. The SPORT-KIT stuff in retro-fried SOHC-4 four-mat? Just little KITS is all. One step at a time. HUGE potential for that kinda thing, imho.